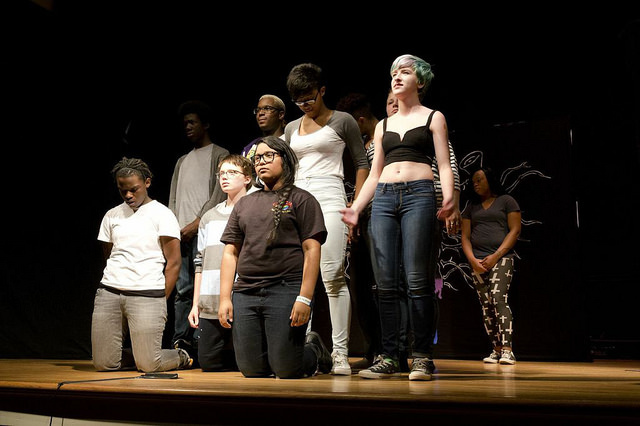 If you don’t know them, the True Colors mission is to train and activate lesbian, gay, bisexual, transgender and allied youth leaders ages 14-29 through a proven community-based theater approach. After growing up in your basic conservative home town from the movies, moving to the city for college was quite a shock. At 18, I quickly started to realize that growing up feeling different from the people I was surrounded by, was not all that uncommon. I learned that queer isn’t a curse word! And finally started expressing myself according to my true identity; an artist, a transgender man, a poet. Sometimes I imagine getting those 18 years back. Sometimes I wonder what a grade school experience is like living as one’s whole and authentic self, and to have had the vocabulary to describe my experience. I’ve since had the opportunity to witness just that happening all around me, and specifically in the work of the True Colors: OUT Youth Theater. [Y]outh involved at True Colors are not only encouraged to express themselves through an active art form – but also are encouraged to organize, teach, and advocate for their communities. The youth involved at True Colors are not only encouraged to express themselves through an active art form – but also are encouraged to organize, teach, and advocate for their communities. True Colors is also currently having screenings for a brand new documentary. “The Year We Thought About Love’ is a 68 minute documentary film which celebrates the powerful work of a Boston LGBTQ troupe, True Colors: OUT Youth Theater, as they write a play about love.” An official selection of both the Santa Barbara International Film Festival, and the Big Sky Documentary Film Festival 2015, this film follows as “a diverse troupe of LGBTQ youth transforms their personal struggles into theater for social change”. The next screening of The Year We Thought About Love takes place March 15, 2015 at Hibernian Hall in Roxbury, MA. (Online tickets for this screening have sold out; a limited number will be available at the door). Check out more upcoming screening dates! This group of inspiring young people is truly the example: when youth are invited to participate, they will take action for equal treatment, equal expression, and they have the ability to inspire us all to move forward and love deeply. If you or someone you know is having trouble forming a GSA in their school, contact GLAD Answers (800-455-GLAD) and let us help you get the treatment you deserve in school.